Soooo, I’ve been holed up in the bakery for the past few months, frantically scurrying around trying to get my Brooklyn Boy Bagels business off the ground. It’s an obvious statement, but starting up your own business is damn hard work. I reckon the sleep deprivation and stress of being a baker is perfect training for having kids. I’m not there yet (sorry, Mom! ), but at least I’m pretty confident now that I can survive it. With that in mind, I paired up with talented professional photographer Connie Chan, and we went through dozens of my ridiculous ideas until this last one popped up at the very last minute. 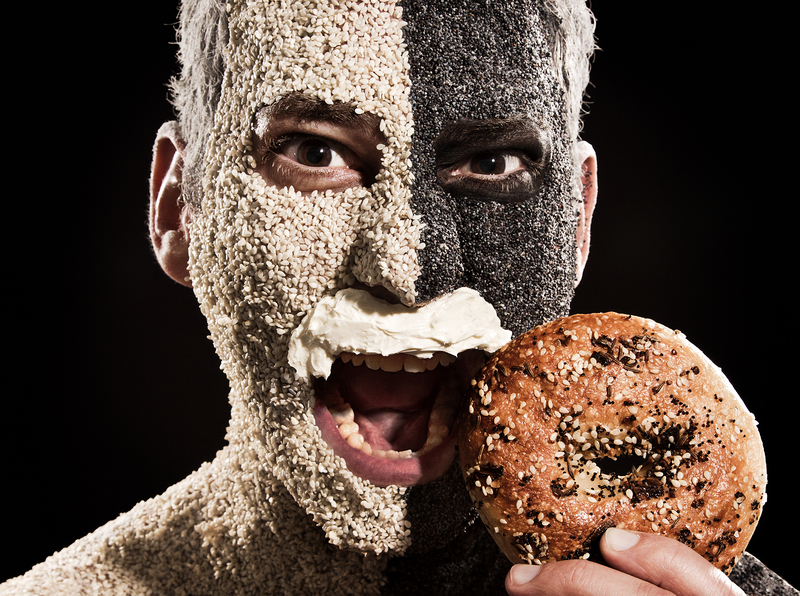 “How about we completely cover me in bagel ingredients?” I asked Connie, fully expecting her to raise another concerned eyebrow at yet another quirky idea from my always-spinning brain. She surprised me by loving the idea. So before she came to her senses, I scampered around for a make-up artist and off we went. Well, Murphy’s Law arrived as usual, and the make-up artist didn’t. Connie and I wanted to freak out and rail against the bagel gods, but we didn’t have a backup option, so we zipped off to a make-up and special effects shop in Newtown, did a quick consult and then sped off to the Chemist for some black eye shadow to boot. A mere five hours of latex application – and heaps of poppy and sesame seeds in my eyes, up my nose, in my ears and through my mouth – we were nearly there. All it took was a finishing touch of flour in my hair (which just made me look old, so we cropped it) and a moustache schmear of cream cheese, and off we went. Cream cheese, by the way, lasts for about five photos before it flops off in a messy schmear onto your pants. I hope you agree that the end result is pretty awesome. And now that we’ve submitted the photo for consideration, we need YOUR HELP! The competition has a people’s choice award, and we’re going to do our damnedest to get over the line. So if you can spare five seconds, please grace us with your presence at the following link and simply click the like (thumb’s up) icon to the left. We need hundreds of likes, so your vote is crucial, nay lifesaving! (Probably.) And if you can share this on Twitter, Facebook or your favourite blog, we’d love you that much more. It’ll take about three blinks, we promise! What a blog! !.Way to go Michael…all the best!! That’s the best you’ve looked in a while Michael!